If ever there was a day for sharing stories, it would be on Sept. 11, 2011. Knowing that weighed on me as August turned to September. For almost 10 years, I’d written about Remembering 9/11, sharing my stories. What more could I offer to best commemorate, to add meaning on this tenth anniversary? Sitting and staring blindly out the window didn’t produce any answers, so I walked, talked to myself, walked some more, wondered, and waited. Finally I found myself at the south end of the lake, taking a long look at West Kennebago mirrored in the calm water, framed in evergreen and the clear morning sky. Then I felt it: Something was up with Edie. Of course, something was up with her. I knew many, many things would have to be up with her. My friend Edie Lutnick, Co-Founder and Executive Director of the Cantor Fitzgerald Relief Fund, would be busier than ever planning the tenth anniversary memorial service, helping her families pay tribute to their 658 loved ones who were killed at the World Trade Center attacks in 2001. She’d be missing her brother Gary like he’d been ripped from her life just yesterday. And she’d be thinking back, wondering when the days and weeks she’d struggled just to hold her head up and keep moving forward without him had somehow stretched into a decade. My 9/11 story led me to Edie’s story a few months after the tragedy. I’d gone to New York on a whim, hoping for some answers. Is this all there is—a painful, haphazard existence only briefly touched by joy? With so much love lost in death, is there any hope it can still reach us in spirit, help us cope? I found my proof and wrote about it in Come and Meet Those Dancin’ Feet. I found Edie, too. Sharing my story soon became a catalyst, setting off a string of serendipitous connections that kept looping back around to Edie and her work. A kindred spirit on a different path, she was a woman I otherwise wouldn’t have come to know at all. But I instantly knew I admired her tremendously, her resiliency and compassion, her ability to find financial and emotional support for so many in the bleak chaos of post-9/11. I loved her and what she stood for. And, as August turned to September this year, I knew that any more words I could offer on the tenth anniversary would only be a footnote. The real story, the one that truly needed telling, was Edie’s. She had a book in her, for sure. But as a fundamentally private person thrown into a public life—one who was way too preoccupied with the priorities of the day—I couldn’t imagine how she’d ever be able to let her own story take form. The writer in me always longed to help but never said anything, and learned to be content with crafting award nominations, inspirational verses and other snippets. “So, besides busy, how are you?” I emailed as soon as I got back from my walking meditation. We’d lost touch for a bit after I moved to Rangeley and, aside from one or two “How’s life on the lake?” emails, hadn’t caught up in almost a year. I’d barely hit send when her response popped up in my inbox. “I wrote a book,” she said. 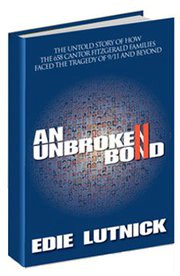 A final draft of An Unbroken Bond was headed to the publishers soon so it could be available by Sept. 11. Could I help proof it and maybe write about it on my blog? Most certainly, I said. I couldn’t wait any longer, and neither should you. There are lots of television shows and documentaries about “9/11.” There are also numerous books and articles that have been written about that event. But none like Edie Lutnick’s An Unbroken Bond. If you read nothing else about 9/11 on its 10th anniversary, you must read this book. Poignantly and painstakingly, Edie lets the reader sit like a 24/7 video camera on her shoulder as she narrates a first-person account, beginning with being awakened by a phone call on September 11th, 2001 that would change her life, and continuing through this anniversary. Edie poses some challenging questions about personal responsibility and justice. She asks, “Have we truly honored the victims that were murdered on what should have been an ordinary day in their lives?” An Unbroken Bond reminds us that the single greatest sacrilege we could perpetrate concerning the events of 9/11 is forgetfulness. So, what have I learned? Before reading Edie’s book, I was part of the “Where were you on Sept. 11th?” population who hadn’t been directly impacted, but thought they knew enough about it. I had a special connection, my own sidebar of a story, and that’s how I coped with the unimaginable. I still will never really know how it was for Edie and the survivors but, now that I’ve read An Unbroken Bond, I understand. Just as Clarence Jones describes in the book’s Foreward (excerpted above), I became more than a reader as I was sitting on Edie’s shoulder day by day over the last decade. It was not an easy ride, but one that I needed to take. The tempo was one minute frenzied, the next minute broken. With raw honesty, grace and amazing humor, she showed me the details of what comprised the “new normal” in her personal life. She took me behind the scenes to endless meetings and strategy sessions so I could look behind the sanitized “Rebuilding Ground Zero” TV and newspaper accounts. I was proud, sad, and often frustrated as I saw her struggles and triumphs while fighting for what was right for her families, but never allowing bitterness to stop her, or her own grief to throw her off balance. Thanks to Edie’s book, I have learned more than ever that the love we’ve lost in death still binds us together. It inspires us to share our stories, to open our eyes and our hearts. On thousands of outstretched arms we can feel but no longer see, it holds us up…unbroken. Order your electronic or print copy now at www.anunbrokenbond.com. Follow An Unbroken Bond on Facebook. Join Edie Lutnick’s network on LinkedIn. For more Rooted In Rangeley remembrances, see Remembering 9/11 and Wishful Thinking on This September Day. This entry was posted in Family and friends, Mindfulness, health and healing, Remembering 9/11 and tagged An Unbroken Bond, Cantor Relief, Edie Lutnick. Bookmark the permalink.